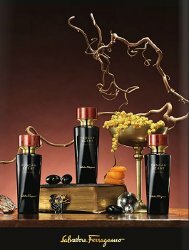 Salvatore Ferragamo has launched Tuscan Scent, a new trio of unisex fragrances geared towards the Middle East: White Mimosa, Golden Acacia and Incense Suede. White Mimosa ~ An oriental floral musk. "This fragrance celebrates the tender Tuscan white mimosa flower with its harmonious blend of precious white blossoms and sumptuous rich texture. On top, the scent opens with a soft creamy white blend of ambrette seeds, faceted by luminous mandarin drops. In the heart, the mimosa intoxicates with its powdery, musky, sensual scent, enhancing its hypnotic power with mellow tones of heliotrope. In the dry down, the soft and elegant union of iris and vanilla creates a soft addiction, contrasted by a chypre sophistication." Golden Acacia ~ An oriental amber. "Shimmering glints of golden acacia honey are captured in this mystic scent to create the perfect union of sweet Tuscan drops and amber spirals. The shining top reverberates of glorious broom petals, irradiated by orange blossom sparkles. The rich and voluptuous acacia honey signs indelibly the opulent heart, in which its sweet trail perfectly match the woody facets of patchouli. The dry down is a warm embrace of resinous notes of amber and opoponax, gently brushed by smooth oriental caresses." Incense Suede ~ A woody leather. "A tribute to the intense richness of suede and incense, this fragrance is a precious blend of Tuscan tradition and perfumery that captures the iconic elegance of suede and the fascinating sensuality of incense. On top, the fragrance reveals the radiant richness of incense, touched with the spicy freshness of pink pepper. In heart, the powerful leather note creates a sumptuous texture, enriched with the troubling warmth and the hypnotic character of saffron. In the dry down, styrax provides a balsamic and slightly smoky woodiness, elegantly twisted with the tobacco tonalities of mate." Ferragamo Tuscan Scent White Mimosa, Golden Acacia and Incense Suede are available now at Harrods in the UK, 75 ml Eau de Parfum, £170 each. Update: Tuscan Scent White Mimosa was developed by perfumer Christine Nagel; Golden Acacia was developed by perfumer Antonie Lie; Incense Suede was developed by perfumer Fabrice Pellegrin. Anything that is geared towards the Middle Eastern market these days seems to mean quadruple the price. Not to be snarky (well…) but does the ingredient quality justify the the hike? I would be surprised if they didn’t use more expensive materials for these, but to the tune of £170…probably not. The first two sound lovely and I like the look of the bottles but since they’re not currently available here, they will probably just disappear from my brain.